It’s that time of year again. School is out, and graduation gifts are in order. My recent trip to the bank for a couple of crisp $100 bills reminded me of the evolution of printed money. I was excited to see the redesigned $100 bill. While the money was printed or placed into circulation in October 2013, this is the first time I’ve actually seen and held one of the bills. At first glance, the bill is much more colorful than prior bills. A quick glance at the back of the bill shows green, cream, and copper colors. No more “greenbacks.” The front of the bill shows an overall bluer shade, not as green as prior issues. Other colors on the front include black, green, dark blue, copper, cream, and yellow. You don’t see the yellow? Take a closer look at the left hand side around the US Federal Reserve System seal and notice the tiny “100” digits. This is quite a difference from the 2006 series which sported only a black and green front. Obviously printing bills in full color requires more resources. However, the newly added security features make it really difficult to counterfeit these bills. 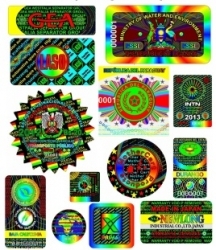 Since security printing is what I am into, I find this topic interesting. Hopefully you find something here that is interesting or even helpful for you. My favorite feature is the hidden graphic that becomes visible when the bill is held up to light. Take a look at the blank, cream area on the right side of the front. Who do you see in the portrait? I am interested to know this because the twelve people I showed this to all said they saw President George Washington. 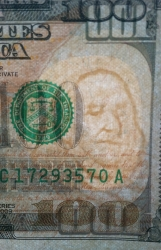 However, the US Treasury site claims the hidden watermark is an image of an older Benjamin Franklin. Could this just be a typo on the US Treasury site? Or, could someone have overlooked the source of the image, and perhaps used the incorrect one? We’ll probably never know. I would be interested to hear your take on this. In my opinion, the hidden graphic is President George Washington, not Benjamin Franklin. When held up to light, a hidden security thread towards the left hand front side is revealed. It is a vertical stripe imprinted with “100” and “USA.” Shining a UV light on the thread will cause the thread to appear pink. There is a holographic feature on the front. The copper inkwell (yes, that’s what it is supposed to be), and copper “100” will shift in color from copper to green when tilted in light. The area along Ben Franklin’s left shoulder is embossed, raised, slightly textured printing, as is the green US Treasury seal on the front. The “100” on the back side of the bill appears to be copper in color, when it is in fact made up of several colors to aid those who may be visually impaired. If you look closely, notice the violet, then cream colored borders around each numeral. Then take a look in the numerals themselves where you will see several horizontal lines in several colors. There is also some embossed,textured printing which can be found along Ben’s shoulder. Also check Ben's collar and around the blank, cream space surrounding the hidden watermark for some micro-printing. Of course there is also the intaglio, guilloche, or intricate pattern printing, within the front and back borders. Finally, each bill contains an eleven digit serial number to help law enforcement with tracking. Printing a paper note in full color, with the above security features implemented, requires more resources than paper notes issued prior. 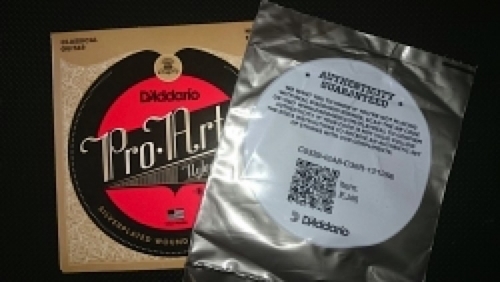 With the latest printing technology, the intended effect of thwarting counterfeiters is becoming almost a certainty.